When choosing rodent models for drug discovery investigations, it’s important to keep in mind that the ultimate goal is developing novel treatments for human diseases. Thus, choosing human disease models that closely replicate the disease of interest should always be an important consideration. However, rodent models often incompletely replicate human disease, and variables beyond the model can have a dramatic influence on the study. Experimental capabilities, budget, and available time exemplify some of these variables. By weighing the strengths and weaknesses of disease models within the context of the influential external variables, researchers can choose the best models to maximize their research output. In this tutorial, the topic of rodent model selection will be explored, with emphasis on identifying model properties that can maximize data collection by minimizing lost time and cost. A transgenic mouse model of rheumatoid arthritis will be used as a case study. The assessment of this example will help create a logical framework that can be applied and extended to improve model selection in the experimental pipeline. First, the example model in this tutorial is the human TNF-alpha (hTNF-α) transgenic mouse, a model of rheumatoid arthritis (RA). This well-characterized model has been shown in the literature to be extremely versatile. It has a track record of enabling drug discovery, and offers an example that is perhaps more “ideal” than most models available for investigations. Nevertheless, highlighting the properties that make this model excellent for many studies can contribute toward understanding what to look for when selecting a disease model. Second, this tutorial is based on the assumption that investigators face real-world limitations; likely a reasonable, yet limited, budget, timeline and set of capabilities. The point here is not to state the obvious, but to introduce the idea that models can be selected to emphasize strengths and to supplement areas where there are limitations. However, it’s also important to point out that choosing a model because it benefits one area often comes at a cost elsewhere. Rodent models that capture much of the biology of a human disease will exhibit the related disease symptoms and morbidities, often in inter-species comparable timelines. Effectively capturing this biology can better inform clinical study design, potentially improving the accuracy and reliability of the stage where real lives and massive financial and time investments are at stake. Accurately replicating the symptoms and timeline of a human disease can also increase a model’s versatility and extensibility as a research tool. Some extremely versatile models enable curative, therapeutic, and preventative research investigations, and can help deliver discoveries involving multiple aspects of a disease. Thus, rodent models that manage to capture substantial human disease pathobiology can help to hedge a research program, not only by providing better insights relevant to human trials, but also by providing a tool that can serve as a platform for various related therapeutic discoveries. RA patient symptoms share considerable overlap with the phenotypes in the hTNF-α mouse. These mice develop severe chronic arthritis of the forepaws and hindpaws, elevated systemic and localized inflammatory markers, and significant bone loss, all over a predictable timeframe. The model is a resource for studying the progressive effects of constitutively expressed circulating TNFα, a condition mimicking that observed in RA and in a number of other human pathological conditions. Notably, phenotypes in hTNF-α mice result from the transgenic expression of the human form of TNF-α. This type of genetic humanization in models is increasingly desired, in part because data based on interactions between a therapy and a human target protein can enhance the clinical relevance of a study. Indeed, TNF-α was validated as a clinical target in hTNF-α mice. This was an instrumental step toward bringing the first monoclonal antibody for RA to patients in the clinic. After over 20 years, the hTNF-α model continues to be used for RA and inflammation-related research, which speaks to how capturing substantial human biology enhances a model’s extensibility and versatility as a research tool. Since its initial use, improvements in the hTNF-α model have led to better matching of the human RA timeline, increasing the model’s utility in prophylactic and long-term investigations. However, as discussed in the next section, an improved model often depends on experimental context. Indeed, under some contexts, better matching human biology is not a desirable trait in a rodent model. Some strengths and weaknesses of a rodent model are granular and specific, and therefore difficult to address with generalized strategies. These should be dealt with on a case-by-case basis. However, investigators can, more generally, take advantage of the inherent imperfection in all models. This can be achieved by understanding that, given the proper context, flaws in a model can become strengths. Certain model properties offer upsides that include eased downstream data analyses, increased experimental output, reduced experimental costs, and faster discoveries. Often, these desirable properties come at the cost of accurately replicating aspects of human biology that investigators typically try to capture. In many cases, this price is certainly worth paying. With no experimental intervention, hTNF-α mice manifest RA phenotypes with 100% penetrance. This is a deviation from the genetic heritability observed in human RA biology; however, modeling the penetrance of a disease is often not necessary because, in most cases, it would hinder therapeutic discovery. Accordingly, models like the hTNF-α mouse are desirable. High disease penetrance in a model helps to simplify breeding and delivery of reliable study cohorts, which can reduce experimental costs and expedite discovery. Furthermore, because RA phenotypes in hTNF-α mice manifest without the need for additional experimental intervention, a human component that would contribute to increased data variability is excluded from studies. Strong phenotypes in a model resulting from, for example, supraphysiological expression of a pathological protein, can also help to reduce data variability and may also abbreviate experimental timelines. These traits could be desirable within some contexts; however, strong phenotypes can also limit experimentation. For example, the first generation hTNF-alpha (Tg197) model expresses relatively high TNF-α, which results in early disease onset and abbreviated lifespan in the transgenic mice. Consequently, the model’s utility for prophylactic and long-term studies is limited. In the second generation hTNF-α model, careful selection of low transgene expressors widened the prophylactic treatment window and enabled longer-term studies vs. its predecessor (Figure 1). Seemingly an improvement, it’s important to understand that the value of widened treatment windows, like the value of a stronger phenotype, depends on experimental context. For studies that can rule out a need for extended study windows, the higher transgene expression in the first generation hTNF-α model could reduce experimental time and costs, justifying its preferential use. Figure 1. 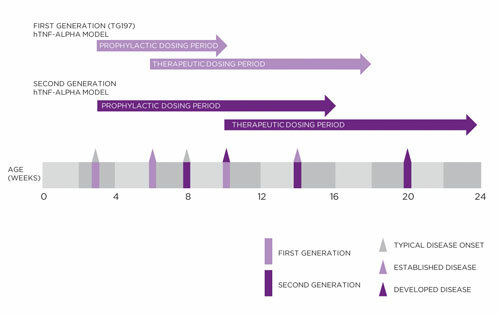 Experimental timelines for first- and second-generation hTNF-a models. The second-generation hTNF-a model expresses comparably low hTNF-a, resulting in a widened prophylactic treatment window and utility in longer-term studies vs. the earlier Tg197 model. For studies that can rule out a need for extended study windows, the higher transgene expression in the first-generation hTNF-a model could reduce experimental time and costs, justifying its preferential use under some experimental contexts. Somewhat related to strong phenotypes, the ability to grossly and/or noninvasively monitor a phenotype is highly desirable. Models having this property enable in vivo screening approaches, allowing investigators to test multiple compounds and other therapies in the model, with relatively high throughput. Because detailed follow-up need only occur for interventions that visibly impacted the phenotype, considerable cost can be saved with this approach. In this study, the hTNF-α mouse, the RA phenotype manifests as progressive paw swelling and hind-limb clenching (Figure 2). The visible severity of this phenotype can be reliably scored by investigators, providing one example of a grossly apparent phenotype that can be coupled to in vivo screens. Look for this property to obtain models with great potential for returning abundant and relatively easily-interpreted research insights. Being able to visibly monitor and quantify a phenotype will not remove the necessity for invasive and terminal analyses. Thus, rodent disease models that can deliver important terminal data using common laboratory assays should be preferred. 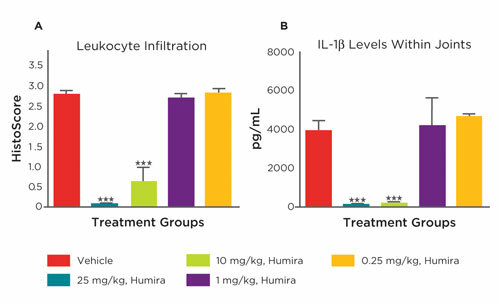 Disease progression and treatment response in the hTNF-α mouse can be monitored by measuring inflammatory cytokines in circulation or tissue homogenates, and through tissue staining that targets infiltrating immune cells (Figure 3). Routine protein analyses like Western blots, ELISAs, and antibody-based IHC/IF are relatively inexpensive, can be performed with high throughput, and can be reliably performed internally or through a contracted research provider. Being able to leverage these common assays to obtain important data from a model offers substantial experimental flexibility and cost-savings that can enhance research output. Figure 2. 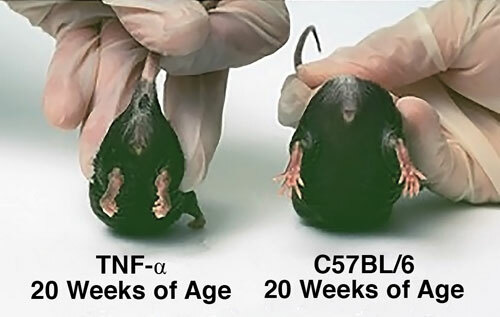 Comparison of RA phenotype in hTNF-a mouse vs. wildtype C57BL/6 mouse. Grossly apparent phenotypes that can be reliably quantified offer great potential for returning abundant and relatively easily interpreted research insights. In the hTNF-a mouse, the RA phenotype manifests as progressive paw swelling and hind-limb clenching. The visible severity of this phenotype can be reliably scored by investigators, providing one example of a grossly apparent phenotype that can be exploited to design informative, expedient, and cost-effective studies. Figure 3. Markers of disease progression and therapeutic response in the hTNF-α mouse. Disease progression and treatment response in the hTNF-α mouse can be monitored with tissue staining that targets infiltrating immune cells (A) and by measuring inflammatory cytokines in circulation or tissue homogenates (B). Routine protein analyses like Western blots, ELISAs, and antibody-based IHC/IF are relatively inexpensive, can be performed with high throughput, and can be reliably performed internally or through a contracted research provider. Being able to leverage these and other common assays to obtain important data from a model offers substantial experimental flexibility and cost savings that can enhance research output. Although rodent models of human disease have unique strengths and weaknesses, more general properties can be sought out to improve model selection. Models that accurately capture the biology of a human disease can be extremely versatile and offer increased depth for therapeutic discoveries. However, no model perfectly replicates human disease, and by considering the aspects of human biology that a rodent model captures within the context of your experimental goals, investigators can select models that will help to affordably and efficiently maximize research output. Paul Volden, Ph.D. (paul.volden@taconic.com), is field applications scientist, genetically engineered & humanized immune system models at Taconic Biosciences.